A little while ago, we modified the standard BrewSmith Chocolate Paradise Porter to contain coffee. 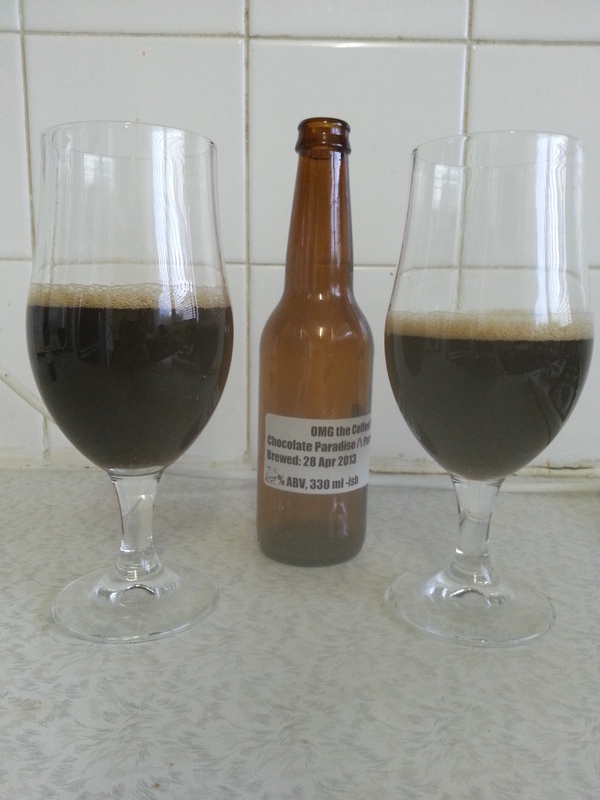 For those interested, the original Chocoalte Paradise Porter brew is here, while the review is here. Anyway, the original taste prior to bottling was encouraging, although there was a lot of coffee in there, and it was slightly overwhelming. After the beer was allowed to condition for a few weeks in the bottle, the overpowering flavours calmed down quite a bit. The coffee was still quite obvious at first, and it really sat in my mouth. This died down after awhile though and I started to get used to it, which allowed the other flavours to come out. As the coffee died down, the brown sugar (which was another addition to the recipe) began to come out, but only slightly. The brown sugar was more of a tease than an actual taste: it never came to the front. The smoke, which was apparent in the original recipe, added a great twist as well. It really began to compete with the coffee and add some a great interaction of different flavours. Unfortunately, all of this tended to mask the chocolate somewhat. The chocolate was still, but hard to find, and didn’t come out until the beer was allowed to breath for a bit. In regards to smell, the beer was nowhere near as fragrant as it was with the original recipe. As I mentioned, the taste before bottling had quite a bit of coffee to it, but the strong coffee smell went away with conditioning; I was really hoping for lots of coffee and peat to it, but it wasn’t there unless you really went looking for it. There was also a little bit of spice and brown sugar in there to. Although very subdued, the beer smelled fantastic. I would have liked the nose to be bigger though. All in all, this beer was full of great things, and they all complimented each other well. It was great that there were different layers of flavour, some very obvious, some very subtle. Sometimes the taste of something would come out of nowhere, and then wouldn’t return on the next sip. It was a great and surprising beer. Finally, it was great to see how a few very simple modifications could dramatically change a beer. The original was good, the modification was better. Yeah, this is one complex and enjoyable beer. There are a lot of different things going on in this beer which makes it a bit hard to really pin point any of the elements. Would agree that the chocolate flavours are hidden by everything else. Have to say, I’m really impressed with this beer now that the coffee has settled down. Food matching, anything rich works well. Roast meats or a juicy stake. Also a good dessert beer due to the coffee.